In Half-Life by Tina Ferraro, fourteen-year-old Trisha Traynor of Four Corners, New York, participates in a little ghost invoking Halloween fun with her friends. The last thing she expects is for a ghost to actually appear. But one does, the ghost of her twin sister Chessie who died tragically, leaving a hole that the rest of her family has struggled to fill. She has a mission for Trisha, one that may repair Trisha's damaged friendship with Abby, and bring her out of her shell. The mission seems simple, but as time passes and her twin asks her to do even stranger things, Trisha begins to wonder just what Chessie is getting her into. A great coming of age story, Trisha's narrative voice is fresh, funny and wonderfully relatable. 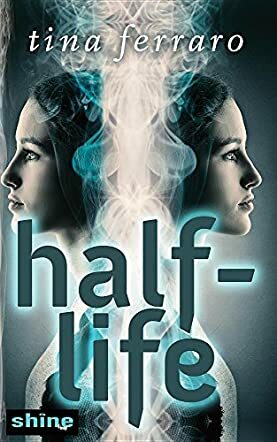 Half-Life by Tina Ferraro is a short read, but it is well crafted with a twist I didn't see coming. At first, because of Chessie's mission, I thought that boys were going to be the main focus of the book, but as I read on I was pleased to discover that though boys do make an appearance, Ferraro keeps the theme firmly rooted in friendship and the changes they go through as teens grow up. She also delves briefly into grief as the Traynor family is still quite affected by Chessie's death, especially their mother who copes by refusing to dwell on the incident at all. How the appearance of Chessie's ghost affects them all is handled very well. All in all, Half-Life by Tina Ferraro is a good Young Adult clean read for anyone looking for a coming of age story with a little ghostly spin.